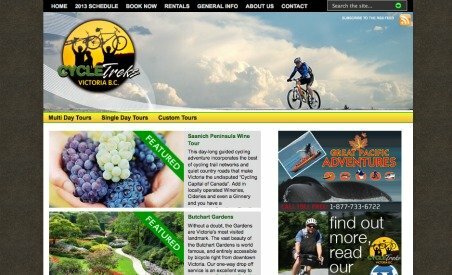 Cycletreks is Vancouver Island’s premier cycle tour specialist. Based in Victoria, British Columbia, they offer a variety of high quality, fully escorted and self-guided riding programs to assist riders of all skill levels in navigating the diverse routes our fantastic regional trail systems offer. From the Galloping Goose Trail network to the intricacies of navigating ferry crossings to the spectacular Gulf Islands, Cycletreks invites you to explore the undisputed “Cycling Capital of Canada."